Today, 19:30, two hours from now, I step into the weight watchers gathering. They don't know me, I don't know them, I shall be new. I shall say I want to join, I want to lose weight. They will look at me just like they are looking at every fat slob joining in. It's not my first time - I went through this weight watchers program two times. First time I started at 125 Kg I think and went all the way down to 86 Kg and I stayed there for more than one year. Then came the inevitable - I added weight and found myself fat again. So I am an experienced dieter... and my experience, or let's say the way I do it is that on my first visit to weight watchers I look disgusting, very fat, fully loaded, totally saturated with food and fat, I even drink a bit - to gain extra weight. And then - I start my diet - and it's a shock to my body. I eat according to the plan, I don't use elevators, I do my cardio, I do my fitness regime and my body doesn't understand what's going on. It is used to spend so many calories cause it knows that at some point in the future I shall replenish, I shall eat something - but I don't !! It takes few days of massive weight loss till my body realizes that it is under a real 'attack' here and by that time I am marching into the weight watchers losing 4-5 Kg on the first week and maybe 3 Kg on the second one. It is only then that my body starts regulating. But, now, less than 2 hours before the bell - I went to look for my last supper. I wasn't eating much this morning even though I tried - I had to defend myself in court and the tension got my blood pressure up to 168-93 with a heart rate of 69 beats per minutes. But after the victory in court - hunger striked me. 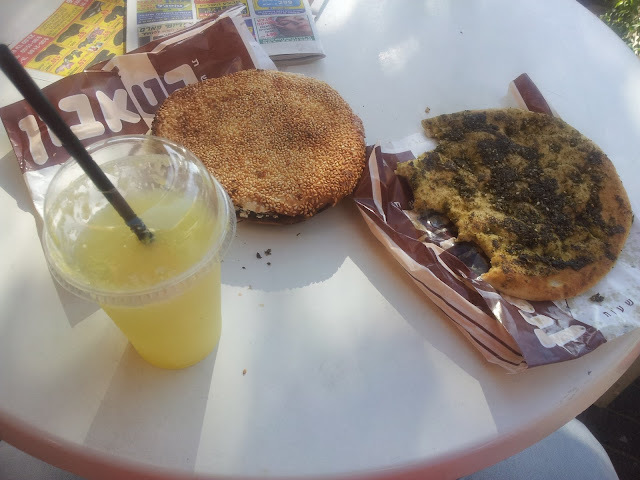 I ate bread with tons of eggs and cheese in Tel Aviv, then I had one hour rest in my office and then I went to Aroma where I ordered the double mozzarella bread and then I went to the taboon to eat 2 more pitas, the last half - I just couldn't eat no more - saturation.